Michigan has 19.3 million acres of forest -- that's 53 percent of the state's land, putting it at number 10 in the nation in forested acreage. And those forests are valuable -- a Michigan State University study put a $17.8 billion annual price tag just on the wood harvested from all those trees. That doesn't account for millions more brought into the state by tourists on their way to hunt, fish, hike or bike in those forests. That's why the Michigan Department of Natural Resources has three pairs of eyes dedicated to spotting alien invasions threatening the state's treasured woodlands. Michigan DNR forest health specialist Roger Mech, with vibratory plow in the background used to separate oak-wilt-infected tree roots from the roots of healthy oak.These foresters spend their days flying above the canopy in single-prop planes, looking for sick and dead trees. 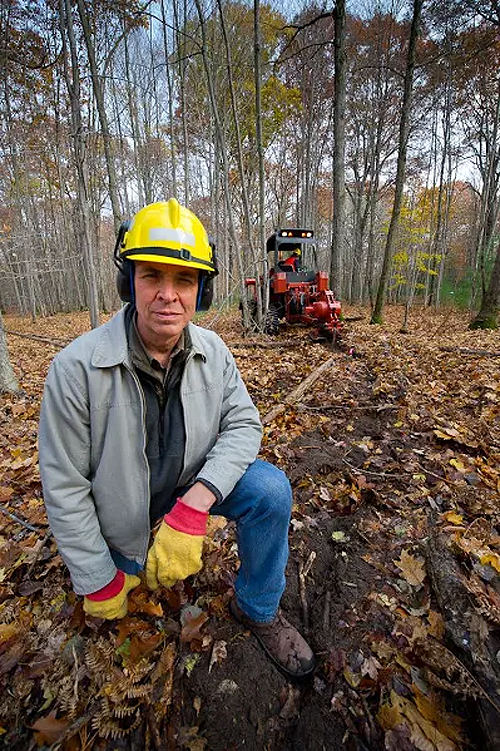 On the ground, they have tools ranging from specially designed root cutters to racket balls covered in velcro, all designed to sleuth out enemies infiltrating Michigan's woodlands. 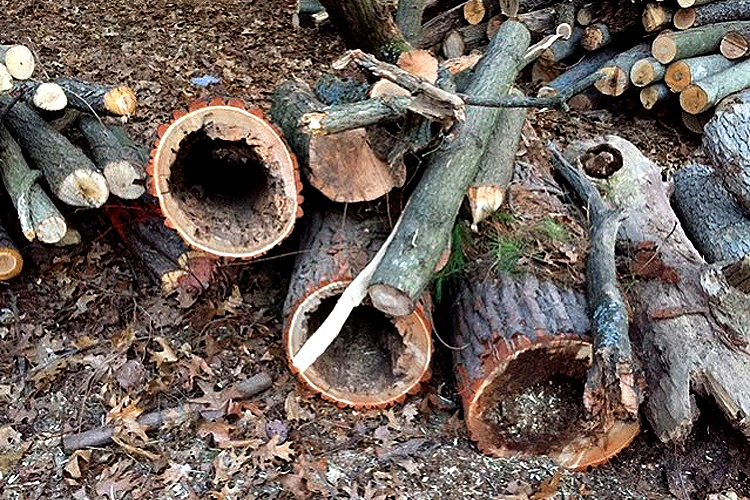 They are on the lookout for invasive insect infestations like the emerald ash borer, which decimated Michigan's native ash tree over the past 15 years, while also keeping an eye out for new threats on the horizon and a resurgence of old pests. Mech points out that the gypsy moth was "probably the grandfather" of invasive bugs eating Michigan trees. It first showed up in the state in the '70s, and in ten years, hungry caterpillars defoliated forest land at a rate of a million acres a year. "Yet in retrospect, it hasn't had the impact some of the more recent exotics have had," he says. Invasive species and pathogens are the number one concern for Michigan's forests, according to the Michigan Department of Natural Resources' latest Forest Health Highlights report. "What we see in Michigan's forests, generally, is good," Heyd says. "We see ash mortality (from Emerald Ash Borer), beech mortality (from Beech Bark Disease) and spruce and fir discoloration (from Spruce Budworm), but we have lots and lots of acres of healthy, productive forests." But the state's woodlands are not without challenges. For one, major species die-offs like the decline of ash impact forest diversity, negatively. Diverse trees mean a diverse variety of other plant species, and diverse animal life -- all of which are key to maintaining a healthy forest. "As species such as ash become rare, we have to look at how to improve the diversity of our resource," says Heyd. Mech points out that in many areas where you'd find beech, you'd also find ash. And where both species are dying simultaneously, acres of forested land will need help to recover. What often remains after a die-off, says Mech, is scrub brush, weak saplings and dead trees that create a fire hazard. Invasive weeds like garlic mustard and buckthorn can then become dominant at ground-level, choking out native plants and saplings. It takes generations for a productive forest, even with human help, to grow again. "It's the permanency of these problems that's so sobering, and makes this such an important thing," Mech says. "There's always something new" in the world of invasive forest pests, both native and non-native, says Mech. Right now, Michigan is bracing for an onslaught of an exotic pest called the Hemlock Woolly Adelgid. It's a tiny bug, native to Asia. The first signs that a hemlock is infested are small, woolly growths on stems at the base of needles, usually high up in the tree. 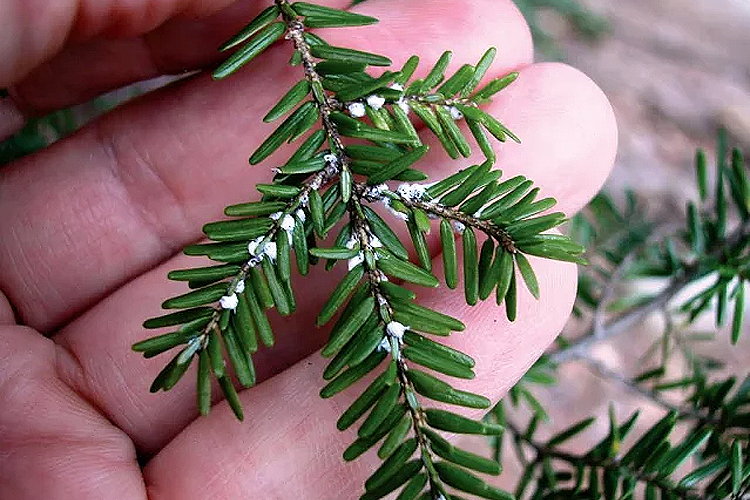 The adelgid is tiny, but it can kill a hemlock in a few years. Adelgid likely arrived here via infected nursery and landscape stock from eastern states. Michigan's Department of Agriculture and Rural Development has a quarantine in effect, banning the importation of hemlock from the HWA-infested east. A sign of hemlock woolly adelgid infestation: Wool-like ovisacs, which protect the insect and its eggs. Ovisacs appear between late fall to early summer.It' a big concern because we have "enormous forests of pure hemlock." In the eastern U.P. 's state parks, "you're talking trees that are centuries and centuries old." Because the Hemlock is a slow-growing tree, it will take a lifetime for others to replace dead trees, if they can. Tourists might still come to see the Tahquamenon Falls, but it just won't be the same with denuded banks. So far, Michigan's adelgid infestations have been limited to isolated outbreaks detected in a few Michigan counties, the latest being in Muskegon, Ottawa and Allegan. Another impending threat is the Spruce Budworm, a native greenish-brown little caterpillar with a bud-like black head. Aside from turning evergreens brown, it has the charming habit of dangling at face level from web strands. They eventually become brown moths that spread the infestation. Major budworm infestations come and go in 30- to 50-year cycles (because it's native, natural predators eventually take care of it) and it looks like its population starting to boom again around the Great Lakes. If it reaches peak infestation as in other cycles "we'll lose 60 percent of our mature balsam fir, and something less than half of our spruce," Heyd says. Yet another threat is Beech Bark Disease. Caused by an insect from Europe that makes trees susceptible to a native fungus, the nearly microscopic bug is spreading through the eastern upper and northern lower peninsula. It forms white, waxy or woolly scales as it feeds on sap, causing wounds that become infected by fungi, killing the tree. Tree trunks appear white-washed by the disease. Heyd says the DNR is looking at replanting decimated areas with oak and white pine. He notes that any forest dominated by a single species, such as beech, is susceptible to major damage due to pests and disease that target that species. One bit of good news is the discovery that some beech are disease-resistant. Mech says that he's seen acres of beech "just white-washed" by scale and fungi, but in the middle of diseased trees stand the occasional untouched tree. The DNR is working with the U.S. Forest Service to breed resistant beech. Two seed orchards are growing them now, and test trees planted in diseased areas of the U.P. are doing well, according to Mech. Oak Wilt kills oak trees during the spring and early summer across southern Michigan. Another big challenge is Oak Wilt. Caused by an exotic pathogenic fungus, it is transported between trees via underground root connections as well as by sap beetles that carry the fungal spores. The disease is most prevalent in the southern lower peninsula. Michigan has had some success defending its forests against alien invaders with natural weapons. One early example is when the state fought the birch leafminer, which was a big problem when Heyd started his career in 1979. Parasites were found in the insect's native Europe that only attacked the leafminer. Those parasites were released in Michigan 35 years ago. "I don't map any birch leafminer anymore," says Heyd. Using the same idea, the state's foresters are releasing a tiny parasitic wasp from Asia in the hopes that it will control the emerald ash borer. What it does to to the borer may be gratifying for those who hate the borer for killing off our ash forests. The wasps lay eggs on the borer worms; eggs hatch, wasp larva eat into the worms and.... well imagine something out of the movie "Alien." The wasps, which are harmless to humans and native life, may help control the borers enough to allow ash to grow again in Michigan. But it'll be years until we know if it's a success, Heyd says. While flying over millions of acres, DNR's forest health specialists use a digital mobile sketch mapping (DMSM) system, a GPS-connected tablet computers containing detailed satellite maps. In the air they can mark where a suspicious tree is, and the DMSM can later take them directly to it on the ground. "Years and years ago, we'd go up with paper maps and wax pencils and do our best to circle on the map what we're seeing out the window," Mech says. But even with state staff at work keeping an eye on forest health, getting to all of those trees on the ground remains a challenge. The DNR is getting a lot of outside help from Michigan State University, which is conducting extensive research on invasive pests and how to combat them. And Cooperative Invasive Species Management Areas (CISMAs), united forces of public, nonprofit and private groups working to combat invasive species, have become a big help, Mech says. But they could always use the eyes of regular Michiganders. So if you see a sick tree, look up its symptoms, and report it. "Just drop us an email or give us a call," Mech says. Emails can be sent to DNR-Forestry@michigan.gov or you can call 517-284-5900. And there's another kind of "eyes on the woods" that Heyd encourages -- visiting the state's forests to witness their beauty. On his off hours, Heyd hikes into the deep woods of Marquette County, places where no one goes, where bear are common, wolves are present, and even cougar have been spotted. "I like to climb to the top of one of these ridges and just sit there for two hours, overlooking a valley. Or climb a tree and watch the wildlife walk beneath me." He sees the forest as a complex living system -- one that is resilient but susceptible to disease that can cause destruction lasting several human lifetimes. Michigan's economy is damaged when the trees are damaged. But there are also "intangibles" in tree value, Heyd says. That intangible value can't be measured in dollars. "I'm in the business because of that. My goal is to stand in the forest and understand what's under my feet and all around me and why it's there and what's going on. The more I understand, the better I feel." For more information and to report invasives: MSU's Midwest Invasive Species Information Network. One of the most important things yu can do to help stop the spread of forest pests is to manage firewood properly. Learn the rules for firewood use on the Michigan page of the Nature Conservancy's DontMoveFirewood.org.